The company originated in Hvitsten, a small town on Oslofjord in Norway, in 1848 by three Olsen brothers, Fredrik Christian, Petter and Andras, who bought their first ships and began an international shipping company. The company is now into the fifth generation of the family and operates various companies skilled within the cruise and passenger shipping trade, as well as aviation, ships' crewing, shipbuilding and offshore industries. The Fred. Olsen group also has business interests in the luxury hotel sector, estate management, property development and electronics companies. Black Watch. Built: 1972. Entered service with Fred. Olsen: 1996. Gross tonnage: 28,613 GT. Boudicca. Built: 1972. Entered service with Fred. Olsen: 2005. Gross tonnage: 28,388 GT. Braemar. Built: 1993. Entered service with Fred. Olsen: 2001. Gross tonnage: 24,344 GT. Balmoral. Built: 1988. Entered service with Fred. Olsen: 2007. Gross tonnage: 43,537 GT. For most of the year, the ships are based in UK ports. 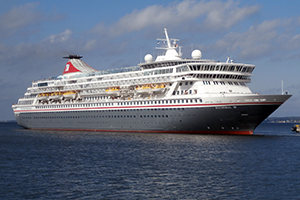 A winter Caribbean fly-cruise programme on Braemar operates from Barbados. 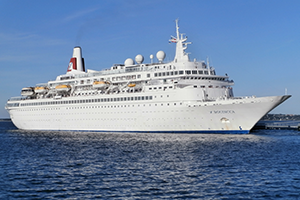 Destinations have included the Mediterranean, Canaries, around the UK, Baltic, Norway, Adriatic and the Caribbean and longer cruise voyages to South America and around the world’. Fred. Olsen Cruise Lines operates a fleet of four cruise ships to destinations in Northern Europe, the Baltic, the Mediterranean, the Adriatic, the Canary Islands, the Caribbean, Africa, Canada, the United States and South America. 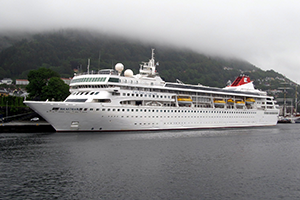 The company operates smaller scale cruise ships, ranging in size from 24,000 to 43,000 GT (approx). The ambiance on board is traditionally British. In May 2006 Fred. Olsen Cruise Lines announced the purchase of a new vessel, Norwegian Crown, from Norwegian Cruise Line. Following delivery of the vessel in November 2007, she was dry-docked for refurbishment and lengthening, with a pre-built 30-meter center section added. 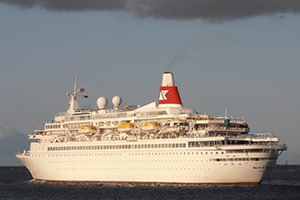 She was renamed Balmoral and entered service early in 2008. This was followed by the extension of Braemar in summer 2008. A new center section was added, with new cabins and public rooms, increasing the size from 19,000 GT to 24,000 GT (approx). In January 2008 it was reported that the company was considering ordering a newbuild of unspecified dimensions from a Korean shipyard. However, no new ship was ever ordered.